Boasting a transparent legal framework and blessed with excellent human resources, Tunisia has a bright future as it bids to attract foreign investors to the Mediterranean basin. ome to 11 million inhabitants and an economy that grew 3.6% year on year in 2012, Tunisia also witnessed a surge in foreign direct investment (FDI) of more than 50%, to nearly $1 billion involving more than 300 new projects. Ranked the top North African country in the latest Ease of Doing Business Index compiled by the World Bank, Tunisia’s overall position of 50th out of 185 comes as it looks to extend its international reach and become the gateway to the continent. The country’s telecommunications networks are regarded as the most advanced in the Mediterranean basin, with high-speed multifunction switches that ensure fast and reliable fixed-line and mobile phone services and Internet access. State-owned Tunisie Telecom has more than 6 million subscribers and operates 24 regional offices. “Our top priority is to consolidate our position in the local market,” says Tunisie Telecom chairman and CEO Mokhtar Mnakri. Such impressive telecommunications networks have helped Tunisia’s banking and financial services sector become a key source of foreign revenue and employment. Key players include Banque Zitouna, which is the first Tunisian bank to specialize in Islamic finance. Founded in 2009, the company aims to run 100 branches by 2017 and also take its successful business model overseas in the coming years. Hannibal Lease, one of the top five companies in the very competitive leasing market, was established in July 2001 by a group of private investors as an independent credit institution with a flexible and autonomous decision-making structure. The firm serves everyone from sole proprietors to midsize enterprises to large corporations and provides funding for various operating assets, including vehicles, industrial and medical equipment, and land and business premises. To ensure that its customers receive fast and efficient service, Hannibal Lease has gradually expanded its branch network in the search for even greater customer satisfaction. The company now operates several agencies in different parts of Tunisia and attaches particular importance to business ethics, namely respect for the client, confidentiality, professionalism, rigor and consistency in the quality of service. Tunis International Bank, part of the Kuwait Projects Company (Holding) Group, more commonly known as KIPCO, is an offshore bank and boasts the capacity and liquidity to fund important projects of foreign companies based in Tunisia. Its managing director is Mohamed Fekih. Arab Tunisian Bank, meanwhile, run by CEO Mohamed Ferid Ben Tanfous, operates 120 branches and focuses its development on a strategic vision based on efficiency, innovation, quality of service, proximity, new technologies and improvement of human resources. The only homegrown reinsurer in the country, Tunis Re works in a very competitive market. Founded in 1981, Tunis Re has gone from strength to strength and is seeking an international partner to take advantage of further lucrative business opportunities across the continent. 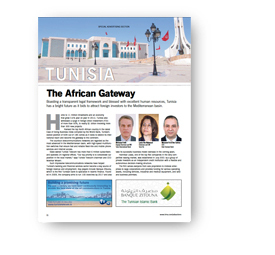 “Tunis Re is a platform for North Africa, however we want to become the continent’s reinsurer, which is why we are looking for a strategic partner for 2014,” explains the company’s chairman and general manager, Lamia Ben Mahmoud.